Fuel cells have a high buzz factor these days. These seemingly magical devices create electricity from hydrogen and oxygen, and produce pure water as their only byproduct. Several major cities already have fleets of buses that use fuel cells, and fuel cell-powered cars that create no pollution at all are slowly becoming more common. Fuel-cell vehicles help us to reduce our dependence on oil and slow global warming while saving money with inexpensive hydrogen fuel. Spacecraft have used fuel cells for decades to produce electricity, since the hydrogen and oxygen they need are both conveniently available in onboard tanks. And in the near future, fuel cells may even be put to more prosaic uses, powering notebook computers, cell phones, and other personal electronic devices. But although fuel cell technology is by no means new, it has yet to achieve large-scale commercial success. One of the main reasons is that hydrogen, the most common fuel, is surprisingly difficult to obtain. Even though hydrogen is present in water, air, and organic matter of all sorts, pure hydrogen is harder to come by. If you use electrolysis to separate water into hydrogen and oxygen so that you can use the hydrogen as fuel to produce electricity, you get into a sort of vicious cycle of energy consumption—it takes almost as much energy to produce the hydrogen in the first place as the hydrogen will later provide when used as fuel. Once you have the pure hydrogen, it’s a pain to store and deliver it safely. So the net cost is fairly high, and the net efficiency is fairly low. If only there were a handier way to obtain hydrogen—or better yet, a fuel cell design that used a more conveniently obtained fuel. Both of these hopes may be met by microbial fuel cells (MFCs), which use bacteria to process virtually any organic matter and turn it into electricity. When I say “virtually any organic matter,” I’m referring to, for example, raw sugar, rotten fruit, dead flies, or even human waste. And in the latter case, microbial fuel cells offer the intriguing capability of purifying the waste and producing fresh water while also creating electricity. Fuel cells convert chemical energy into electrical energy, as do batteries, but fuel cells can sustain their output of electricity as long as the chemical input is maintained. Electricity, of course, is simply a movement of electrons. To oversimplify greatly, a basic fuel cell consists of two sections: the anode, or negative terminal; and the cathode, or positive terminal. These sections are separated by a special membrane that allows only protons (positively charged particles) to pass through, while inhibiting the flow of electrons (negatively charged particles). One substance (typically hydrogen) is fed into the anode section, where a chemical reaction splits off its electrons. Since the electrons can’t flow through the membrane, they flow into the anode, which is connected to an external circuit. The electrons return to the cell’s cathode, where they combine with another substance (typically oxygen) in another chemical reaction that creates a byproduct (in this case, water). One type of microbial fuel cell still relies on hydrogen as the ultimate fuel, but instead of pumping it in from a tank, uses bacteria to create it. Certain strains of E. coli and T. neapolitana, for instance, feed on organic matter and produce hydrogen as a waste product, rather than the more common methane. When incorporated into a fuel cell design, a colony of these critters nicely solves the hydrogen supply problem. A chemical additive then facilitates the transfer of electrons from the hydrogen to the anode. Other bacteria, some of which are found naturally in sewage, can enable a fuel cell to skip the hydrogen step altogether. These bacteria consume organic matter and directly transfer electrons to the fuel cell’s anode. This makes the fuel cell design much simpler, and also increases the feasibility of using the fuel cells to purify the waste fuel into clean water. If you’re interested in exploring MFCs, you can make your own from scratch or from an inexpensive kit. But note that in current MFC designs, efficiency is quite low; it takes a large apparatus, and a lot of waste input, to produce meaningful amounts of electricity. 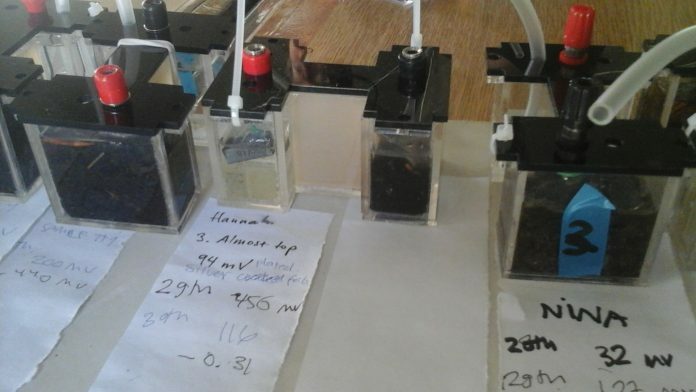 Researchers are hopeful, however, that they can improve the efficiency significantly, making microbial fuel cells a practical means of supplying electricity on a large scale. MFCs are especially attractive for use in long-distance space travel, as they can produce both fresh water and electricity from waste products that would otherwise be useless cargo. Meanwhile, microbial fuel cells are also being considered as long-term power sources for autonomous robots, marine sensing equipment, and other remote electronic devices. A team at the University of the West of England, Bristol built a small proof-of-concept robot called EcoBot II that runs—though quite slowly—on a diet of dead flies or rotten fruit. A future version of the machine may even be designed to find or capture its own food. But not to worry: man-eating robots, I am reliably informed, are still decades away. Note: This is an updated version of an article that originally appeared on Interesting Thing of the Day on April 5, 2005.